Buried in the press cycle of post-election hype, hysteria and dashed-and-undashed hopes around the country, is the fact that, last Thursday, a judge in Michigan – that’s right, in Michigan, not in some underdeveloped country like Rwanda, Somalia, or Ethiopia – ordered the State of Michigan and the City of Flint to immediately start home delivery of four cases of bottled water per resident of Flint, every single week, for the foreseeable future. The only exception is for households that opt out, or where officials have verified that a water filter has been installed and properly maintained, which the judge’s order describes as a seemingly herculean task. Now, ten months later, with a solution to Flint’s water debacle not appreciably closer, can anyone doubt Martinez’s premise about the deplorable divisions existing in this country (along race and class lines) when it comes to accessing clean water? For additional perspective on the problem, compare a column I wrote in February exploring the nefarious link between lead poisoning and the racist imposition of the death penalty, and Rob Kuznia’s piece, several months earlier, in The Washington Post, concerning the reaction of affluent Californians to water restrictions brought on by drought. If these statements are true, there is no more worthy cause Trump can tackle upon taking office than ensuring equal access to clean drinking water for the poor, predominately black people of Flint, Michigan. 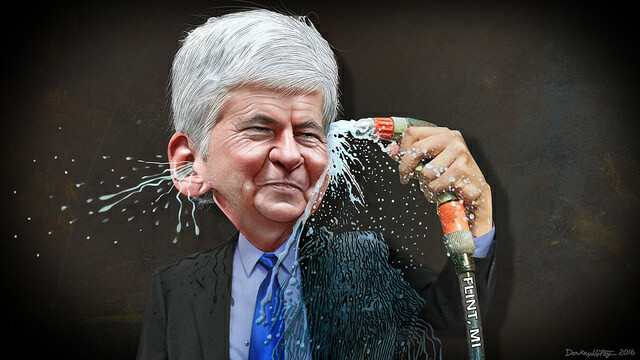 These days it’s vogue to call ambitious, ground-breaking endeavors for the betterment of mankind – such as efforts to defeat cancer – “moonshots.” In the shameful, racist, literally (and figuratively) foul water situation in Michigan, the residents of Flint aren’t trying to fly to the moon, and the “shot” they’re asking for, that they keep asking for – access to clean water – is one much of the nation, especially the white, privileged part, enjoys. Will Trump help Flint, Michigan to solve its water woes? Only time will tell. What’s sure is, it sorely (and bigly) could use it. Trump and the Republicans will solve the water crisis in Flint and elsewhere by privatizing the water system as they’ve4 done in many South American countries already. The result generally has been that prices for water go up , but the system is not upgraded so that the water is safer. The privatization of water supply and sanitation in Bolivia took place during the second mandate of Bolivian President Hugo Banzer (1997-2001) in the form of two major private concessions: One in La Paz/El Alto to Aguas del Illimani S.A. (AISA), a subsidiary of the French Suez (formerly Lyonnaise des Eaux) in 1997; and a second one in Cochabamba to Aguas del Tunari, a subsidiary of the multinationals Biwater and Bechtel in 1999. The World Bank and the International Development Bank highlighted water privatization as a requirement for the Bolivian government in order to retain ongoing state loans. This is what Flint has to look forward to.